UAC’s control and shutdown in Windows 7, Windows 8 and Vista OS. 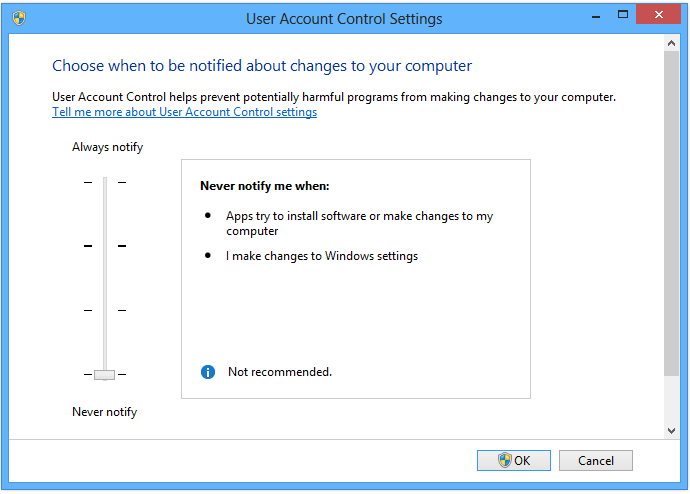 UAC (Accounts Control) — the one of the most important tools for the safety increase in Windows 7 and Windows 8. However, as it often happens with useful, but the tiresome innovations, the new function was coldly accepted by the majority of users. Choose the operating system where you have to disconnect or adjust UAC: Windows 8 | Windows 7 | Vista. Before passing to the description of the method how to shutdown and control this function, we warn about inevitable decrease of the computer’s general protection level from the various threats. After shutdown of accounts control the system becomes more vulnerable to such widespread threats like: programs spies, viruses, worms, trojans and rootkits. Use the anti-virus programs for computer safety. We recommend you the free antivirus of Microsoft Security Essentials. To increase your system’s general safety and level of protection, probably, you have to be humbled to small inconveniences of the service work. Especially, as the practice shows, UAC’s preventions irritate users only at the early stages of using. Later you will get used to UAC and perceive the service work as the due. The simplest and convenient way of the shutdown or change of UAC protection level — is the control via the «Control panel» in Windows 7 and Vista. Let’s consider it more detailly. Enter into system as the root (This account is chosen by default). Enter the UAC abbreviation, allocate the «Settings» element and choose «Change of accounts control settings» in the searching results. Choose the extent of protection you want changing the toddler position and using the description in the right part of the screen (we recommend the level «To notify only because of applications’ attempts to change anything in computer»). 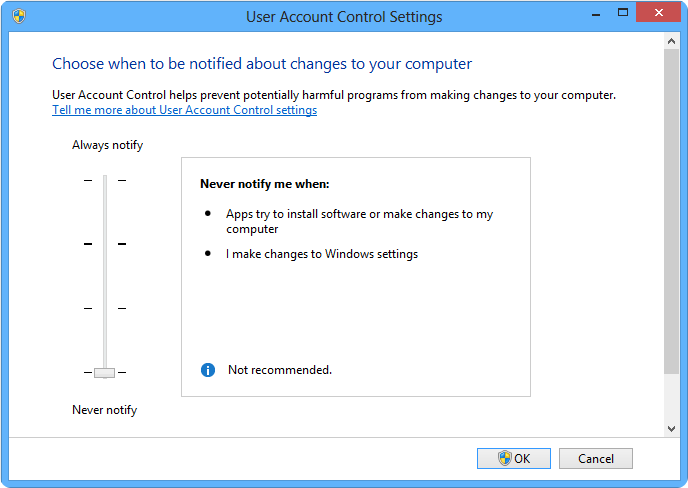 For disabling UAC transfer the slider to the bottom level «Not to notify me» ». Press „OK“ to save the settings and reboot the computer. Before executing of these actions, enter into system via the root account. For the UAC blackout transfer the slider to the bottom level «Never notify». Press «OK» to save the settings and reboot the computer. 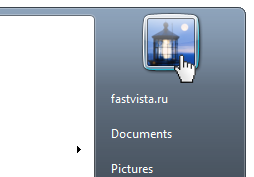 The UAC control panel also can be called via the built-in searching system of Windows 7. In case if you open the accounts control using the searching system and it isn’t completed, open the menu «Start» > «Control panel» > Replace the review mode from «Category» to «Small icons». Open the section «Users’ accounts» > «Change of accounts control settings» and make the settings which are described below. If you try to change something in the UAC settings, and you are in the system via the user’s account, Windows will request the root’s password for changes’ confirmation. Ask the system administrator to enter into the system via his root account and enter the password or change these settings. Also we recommend examining our advices to Windows 7 optimization for achievement of the maximal system productivity. It is possible to check your system authenticity at the special page of the Microsoft site: Windows authenticity check onlineUAC is disconnected. After shutdown of this option we recommended establishing of the anti-virus software. If the Windows 7 license copy is established on this computer, use the free program Microsoft Security Essentials. You can get to know all the particulars and download MSE at the Microsoft official site. If you still have the questions about this theme — write us in the comment section right after the article. We will try to help you.